Spring is one of my favorite times of year so, I had to take a break from furnishing our new home and move outside to our patio! 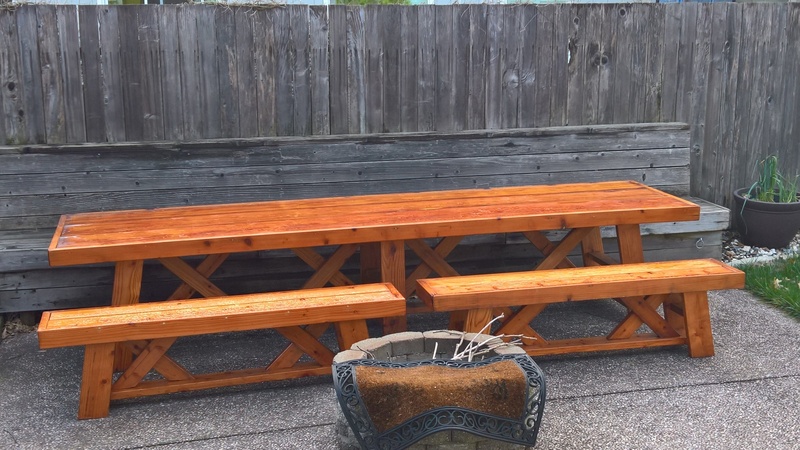 I’ve been dying to build an outdoor table for this space and with a few 2×4’s and 2×6’s, I created this super stout and GORGEOUS outdoor table for – wait for it – only $65! Of course, we have the printable plans for you to build your own! You can click the image below or HERE to print them! You can find plans to the matching set of benches HERE. A huge thank you to our friend Jay from Jays Custom Creations for converting our table design into PDF plans for you! And, as always, I am also sharing the step-by-step pictures for you to follow along! I started by cutting the legs at 10 degree angles. We always make sure to protect our eyes and ears when we are building! These 3M safety glasses and headphones are some of our faves from the 3M Safety Products line! I used my Kreg Jig® K5 to drill pocket holes in both ends of each leg. You can see that I have it set at 1 1/2″ pocket holes. I used 2 1/2″ exterior pocket hole screws and wood glue to assemble the legs. I attached the legs to the planked top and attached the stretcher with wood glue and pocket hole screws. Then the support under the table top. Now for the fun 🙂 I started attaching the double “x’s”. This is a great place to measure and cut as you build! Now, because I was designing the table as I was building, I added the trim as the final step. Don’t do this! Follow the plans and do it first but I did want to show this step so that you can see how I measure for the trim as I go. I cut the long pieces first, attached them and then measured for the short pieces. Ahhhhhh! Love it! This table has TONS of pocket holes so I did have to fill them. and after it dried, I used 80-grit sandpaper from the 3M Advanced Abrasives line to smooth the wood filler out flush with the wood. For the finish, I used one-coat of Rust-Oleum® Carrington Stain then used a sander to distress all over the table to get the worn look! Follow 3M on their social networks! Can I make an 8ft table top and use the same base? I want it a bit longer for more leg room on the ends. Can I make this an 8ft table top with the same base? I want it a bit longer. What are the final dimensions finished? I’m making a scale model of my space and I’m trying to determine if it will fit comfortably. Hey, thanks so much for the plans! We altered them slightly to give us a 12 ft. table, and I got lazy, and tired of pocket hole screws, so just put a few straight through where I didn’t think it made too much of a difference. Also, I used redwood, so the price for the lumber was about 5x as much. Thanks again, the plans were super easy to follow and I bought exactly what I needed, based on the cut sheet. How much does the table weigh? I am thinking of building it for my 2nd story deck, but am worried about the logistics of carrying it up and down the stairs to storage every winter. Thoughts? I’m sure you’ve probably built (or not built) your table by now, but just wanted to chime in. I built a larger table (12 ft.) using these plans, and I just didn’t connect the table top to the base, allowing me to separate the two. Because of the weight of the top, I’m not worried about it flipping off, I just placed some braces inside/underneath the top, so that when it’s sitting correctly on the base, it won’t slide. This way, moving the table is much easier. How do you join the corners of the trim together? The wood seems too thin to use pocket holes. The instructions say “Pre-drill and countersink two 2-1/2 inch wood screws into each miter to connect them” I don’t know what countersinking is. Does anyone have a picture I can see? Hi! I’ve looked at a lot of your outdoor project plans. Just a quick question, do you use treated wood? Or do you find regular wood works just fine? Would you make any changes to this for an indoor table? I love the base and would like it for my dining room. Thanks! How do you put the finish coat on so it goes smooth of the boards.. I made one and had to sand off the finish because it wasn’t put on correctly.. do you have any tips? Look what we made with the DIY plans!! It is awesome!! Yes it was tricky at times, costs a bit more and is very heavy, but it is so big and comfy to sit 10 people at!! We live it! Built this table over the weekend – love it! Thanks for sharing the plans. Do you have any plans available for matching benches? Love the color plans along with showing the drill holes. Thank you! How do you get such straight lumber? Do you spend hours at HD or Lowes pulling piece by piece off the racks till you find the right one? Thanks for the response. What about 4x4s? I have searched and searched and in Charleston, SC the only thing available is treated. Where do you get your untreated 4x4s? They sell them at Home Depot here but I have heard of people having to buy them at lumber yards! A jointer & planer will straighten boards but removes material to do it. They are good investment tools if you are serious about woodworking that I highly recommend. I don’t own a planer but I do a jointer and use it for planning wood 6″ wide or less. I still look for the straightest boards when I picking them out but sometimes they move when you get them in your own environment and have to be fixed. Love this!!! I can not wait to build! Going to start today!! First off — I just want to say a big “thank you” for sharing the plans for this build. Sadly, as I was building it today, I hoped for a bit more clarification on a few things. I have just completed the table but I thought it might be helpful for others in the future. 1 – I wished there was something mentioning that the center supports for the legs (2×6 and 2×4) should be at a right angle with the actual (making them flat instead of angled like the boards they connect to). When I built the legs, I made the center supports flush with the legs and didn’t realize til later (while attaching the long support at the end of the project) that they weren’t supposed to be that way. It caused a bit of a “problem” because while attaching the stretcher 2×4 at the end that stretches the length of the table, it wouldn’t connect flush. I had to actually miter the edges to make them sit flush. Sorry, I hope this is making sense. It is late and my preggo brain can’t seem to construct a proper sentence. 2 – The distance between the boards on top doesn’t work out to be 2″. Those building this table will probably have to play with the distances between the boards. 3 – I have a Kreg Jig and use it frequently but those 45 degree mitered angles were a bit awkward to use in the Kreg Jig. I did eventually wing it and get a couple holes in there but a few images or a video might be really helpful. I was surprised at how difficult it was to try to find someone online that had a video or images of how to do this properly. 4 – Since the gaps between my boards were 1 1/2 – 2″ in the center of the table (I made them closer together on the pieces connecting to the frame), the support pieces that connects to the table top and the legs, was a beast to screw in. The gap ran right down the middle meaning there wasn’t much room on either side of the board to attach the screws without running the risk of splitting the wood. Also, I had to put the screws in at an angle to make them work. I noticed in the actual tutorial, you used a 2×6 for this piece but the plans call for a 2×4. I think the 2×6 would actually work better. I would have swapped it out but I had already cut all of the lumber and didn’t happen to have an additional piece of 2×6 long enough. 5 – You did mention this in your actual tutorial but I think it is worth mentioning on the plans too — I HIGHLY recommend who ever builds this in the future to NOT cut the X pieces or the stretcher until everything else is assembled. The plan called for the stretcher to be 57 3/4″. I don’t know how it worked out to be so but my stretched ended up being 62″ long. And the X pieces were definitely trial-and-error. I think I ended up cutting mine about an inch longer than the actual plan called for. 6 – For the actual table top, I found myself wishing that the plan had called for pocket holes on the ENDS of the 2×6 pieces that connect to the long side of the “frame” as well as along the length. When I connected the middle 4 boards with pocket hole screws, it joint was nice and tight. The two boards along the frame had small gaps in the ends where the end met the table. The gaps aren’t large but I think if I were to do it again, I would add pocket holes to the ends of those outside boards as well as along the length. 7 – The last thing, I promise. On the plan, there is not mention of how far from the sides any thing should be connected. For example — when attaching the legs to the table, I wished that I had a “distance from the edge” measurement. The same goes with the connector boards. It would have saved a lot of time to know how far from the sides of the table for the 2×4 and how far from the outside of the legs for the final stretcher. One more thing — for anyone reading this: This table is heavy. HEAVY. I am 30 weeks pregnant and I am not sure I will be able to help my husband life it off the garage floor and stand it upright. haha. I am sure it is at least a couple hundred pounds. I have attached a couple pictures of the process just for fun. The first is a picture of pregnant ole me looking like a crazy lady with my youngest daughter “helping” me. The second is of the table upside down on the garage floor. I JUST added the Xs and will attempt to help my husband flip it over tomorrow morning. The bottom connector piece looks crooked in this picture because of the shadows on the table…it is not actually crooked. I’m sorry you had such a difficult time with this. The plans should use a 2×6 for the top stretcher so we will get that fixed ASAP. As for the other issues, the majority of them could have been solved by measuring and cutting as you built and there are pictures and plan pictures that reference the angle cuts as well as the side stretchers being parallel with the ground. If you have questions while you are building shoot us an email, comment here or find us on our social channels. We always do our best to answer those types of questions. We aren’t perfect and sometimes leave details out but we do our best to help. Thanks! are you able to seat 6 comfortably? Can you sit at the ends with enough leg room. looks great! Beautiful!! Gee, I posted a potential project pic.. but can’t see it. oh well.. Great job!! i can see ur pic cheryl! good idea! I want to make some matching side tables….any possibility that you can provide a plan for this? Pinterest is a good source for table plans. I love your website and all the projects you share here. I’m just starting to build some of your projects and I’d like to know if you usually sand your boards before staining them, either prior to building or afterward? Thanks! !